Rating: 3.5/5 – Superman Battles Dracula and the Frankenstein Monster! Sometimes when you’re organizing your collection, you come across books that immediately draw your attention. For me this week, it was Superman number 344. It was the striking cover by Jose Luis Garcia-Lopez that has Superman looking terrified while in the grasp of Dracula and Frankenstein that made me stop and pull this one out to read. Garcia-Lopez has the three figures on top of a castle against a dark red sky while lightning and rain fill the cover. It’s one of those covers where you can’t help but be interested in the story inside. Unfortunately the story inside just isn’t as strong as the cover would make you believe, due in large part to the art. I’ll start out by saying that Curt Swan’s Superman is one of my favorite interpretations of the character. Swan is the artist in this issue along with Frank Chiaramonte and while his version of Superman is what I’ve come to expect, his drawing of Frankenstein and Dracula never look all that threatening. In fact, his Frankenstein Monster is a bit goofy looking and there’s a panel where the monster is eating cakes out of a delivery truck, in broad daylight, that immediately made me think of the Hostess ads that ran through comics during this time period (and there is a Hostess ad starring Hawkman in this very issue for our reading pleasure!). On the story side, Paul Levitz provides a script based on a story by Len Wein. Superman and Lois are invited to an old castle that may or may not be on the outskirts of Metropolis which is never explained, to write a story about the historic castle, and participate in a seance. 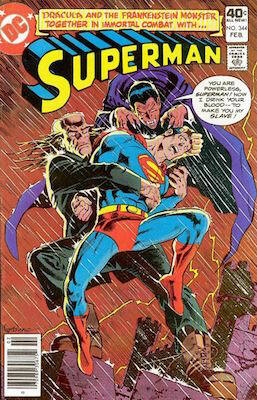 As the seance takes place, the two monsters interrupt the ceremony and eventually go after the medium, causing Superman to intercede and take on both “magical” creatures. It’s always fun to see Superman take on adversaries who are magical in nature since he has a weakness against them, but unfortunately Frankenstein is never really much of a threat which makes the monstrous duo much less imposing. It’s still a fun read though and the ending is all sorts of goofy which made me smile, but you don’t have to rush out and pick this issue up, which you can for probably just a couple bucks. This entry was posted in DC, DC Comics and tagged comic books, comics, Curt Swan, DC Comics, Jose Luis Garcia Lopez, Len Wein, Paul Levitz, Superman, vintage comics. Bookmark the permalink.